You all can probably recall moments of dealing with the complexity of meaning embedded in the tone or the delivery of oral content in interviews. There are sounds of the environment that the informant has chosen to carry out an interview or interact with. 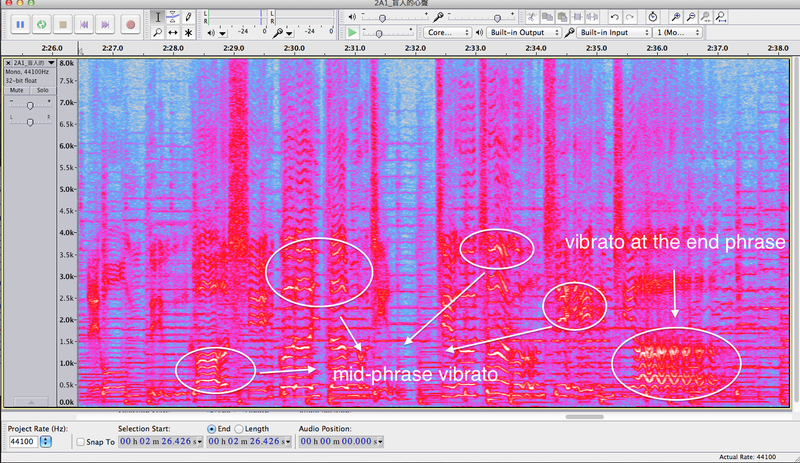 Do these sounds reveal anything about the speaker and her relationship to her physical and social environment? Are there other voices in the room? Incidental sounds? Does the tone of the speaker react to and interact with the sounds of the environment in anyway? Where are the points of dissonance and resonance? Sounds are rich in meanings. Daniel Makagon and Mark Neumann wrote in their book Recording Culture , “getting any kind of recording is also a mode of exploration and investigation in its own right.” Sound recording can be productively considered as an ethnographic practice because it can enlighten us on social life. Textualizing interview recordings can run the risk of flattening the sonic meanings that orbit around a person’s voice and its resonance in an environment. I recommend that while we transcribe (if it has to be done), we pause and listen closely to the textures of sounds and voices that inform our ethnographic understanding. 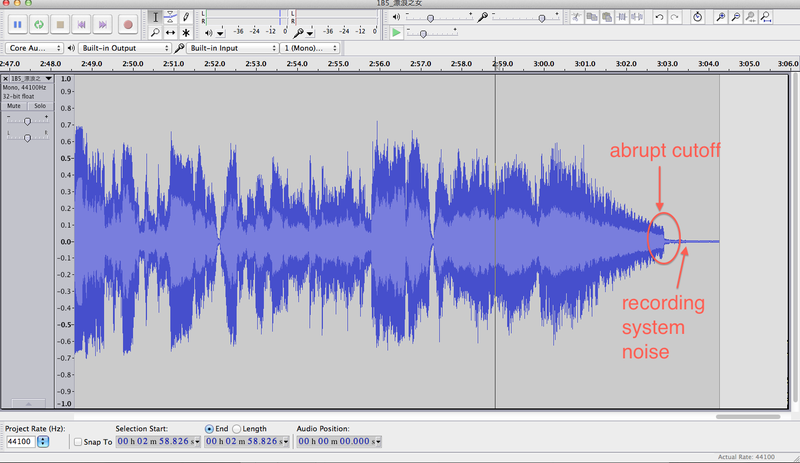 In this post, I give you some tips on how I use digital tools to augment my engagement with the sounds in my research. I encourage you all think about how you may do this with your own fieldwork materials and data. In addition, as the third post of my series on digital ethnography, I will focus on how we might use digital technologies to deepen our engagement with the textures and materiality of culture. Digital technologies afford us the capability to engage with content in multiple modes and at multiple levels. With the example of my webscraping project, I captured data in the form of text, and then translated it into lat-long coordinates that subsequently became visualized as pins and clusters on a map. These clusters then become resized, forming perceptible patterns, as I zoomed in and out on the map. The combination of scalability and multimodality that digital technology offers makes visible both (micro) details and (macro) patterns of cultural content that were previously imperceptible to us. Humans are better than computers at finding patterns that are meaningful because our minds are able to handle contextual thinking and calculating really well. But we also pale in comparison when it comes to switching between modes and scales. So why shy away from utilizing computational power to help facilitate our analytical processes? As an ethnographer who works primarily with sound, in the form of field recordings, interviews, and music recordings, I have found utility in leveraging digital audio workstation [DAW] for the analytical purposes. 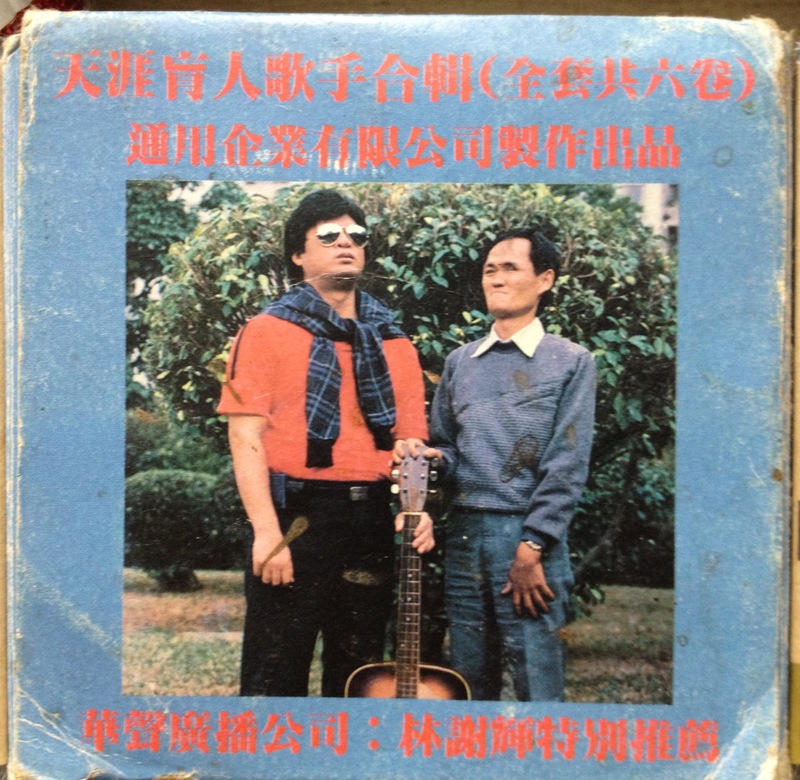 On my last trip to Taiwan, I was lucky enough to get my hands on a set of cassettes of nakashi (postcolonial itinerant) musicians entitled The Wandering Blind Singers [Figure 1]. During the process of digitization, I came to notice sounds that were extraneous to the content of the music. Using Audacity, a free and open-source audio workstation program, I quickly saw that the recordings in this tape set are done in mono. This is unusual since most studio recordings in Taiwan have been produced stereo since the late 70s. Looking at the waveform, which displays the change in amplitude (volume of sound) over time, I found that many of the tracks get cut off before the natural decay of the instruments complete. You can see an abrupt amplitude reduction [figure 2]. Upon closer listening, I discovered an occasional environmental sound seeping through the walls in the studio. In one song, the sounds from a vehicle moving on the street got picked up in the recording. All of these observations add up to an amateur low-fidelity and low-budget production quality. These characteristics, in the context of the recording history in Taiwan, are rather unusual. My conjecture is that this low-budget production is telling of the lower-class status of these nakashi musicians and their fringe position in both the music industry and the society at large. I imagine that the same attention can be applied to visual content (video and photographs), especially after seeing Tricia’s successes with using Instragram as a field image annotation method. 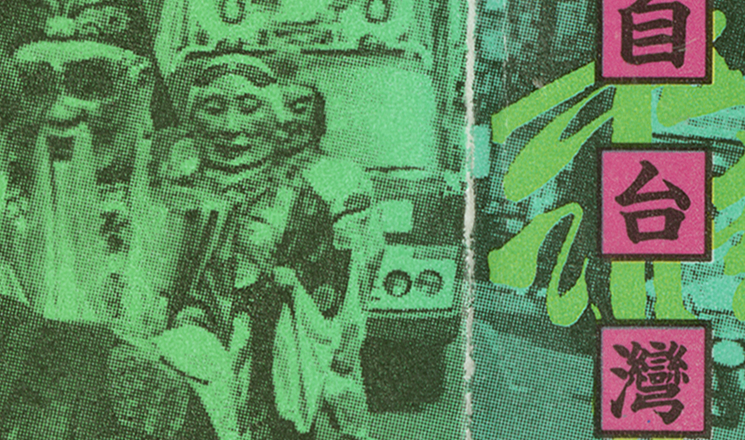 I stumbled upon surprises when I was scanning the album art and liner notes of some of the nakashi tapes. After scanning and then zooming in on the image, I gained a closer view of the granularity of the album art to discover traces of its print production. I will take a cassette entitled “Sounds from Taiwan’s Underclass Vol. 2”, a mix of field recordings and low-budget studio recordings of nakashi artists, Catholic worship songs of Taiwanese aboriginal groups, among others, compiled by renown music critic He Yingyi. The cassette was released by the Taiwan’s historically important indie label Crystal Records in 1995. After zooming in on the artwork, I discovered an unusual dotted pattern in black ink that underlays a few color layers [Figure 4]. According to my archivist colleague, this pattern indicates that the album art was printed via the halftone technique. Without knowing the history of print in Taiwan, I gathered that this print work was done cheaply. By the mid 1990s, Taiwan was the major site of manufacturing of computational components. Halftoning, a common print technique a few decades prior to the 1990s, would have been considered as obsolete in the time of cassette’s production. Given the fact that this cassette was printed as a laser disc, and its Vol. 1 counterparts printed as a double-CD set in the 1991, I suspect that there might have been an another intention, besides saving cost, behind the choice of halftoning the album art. My guess is that the halftone technique was deployed to signify the music’s associations to the social underclass of Taiwan. This hypothesis, of course, is only the beginning of further explorations of cassette and print culture in Taiwan. Before we hurry into tagging and filing media content based on their relevance to our research questions, why not spend some contemplative time deepening our sensory engagement with field materials in their various modes and scales? Small observations can lead to big discoveries. A deepened engagement with cultural content in sonic, visual, and geographic registers has allowed me to see patterns of social linkage and cultural meanings that I had not anticipated in traditional forms of field data analysis. I think of these data processing methods as ways to achieve “radical empiricism,” a term that I use to describe my goals in finding and documenting socio-musical processes with empirical specificity and precision. To add to that discussion, I’d claim that computational immersion is not exclusive to the domain of big data. We ethnographers, too, can achieve immersion — through a computational means — in communities that are digitally embedded or not. I like to think of this computational immersion in two different directions: horizontal and vertical [Figure 5]. Horizontal immersion explores general contours of social actions and events. It typically engages with a large number of data points and provides categorical answers. I consider projects that are heavy on the side of datamining (like my Myspace webscraping project or Alan Lomax’s cantometrics) to take on a horizontal contour. A vertical approach, on the contrary, engages with a single artifact (potentially event, dialog) that represents patterns of cultural life on a larger scale. The techniques that I discussed in this post would fall into the vertical category. Visualizing sound and magnifying images as an interpretative intervention afforded me a closer access to the subtle nuggets of meaning that often resists categorical thinking. 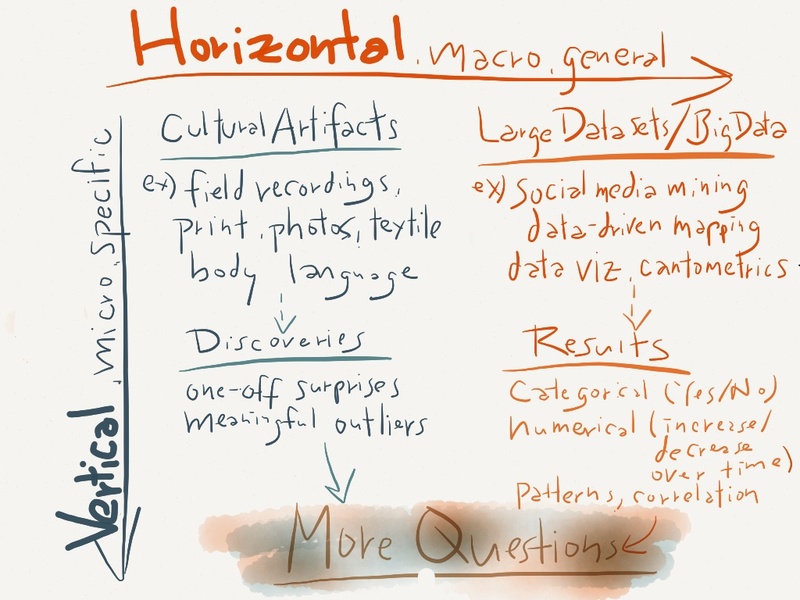 Most ethnographers I know engage with their objects of study in both horizontal and vertical manner, but we usually call it something different, generality-specificity or macro-micro. As ethnographers, we study the social and cultural life. With the tools at our disposal, we could digitize virtually all elements of life. I’m confident that sources of data will continue to proliferate (although our access to them may not). Through the use of recently refined sensing technologies, we could collect data pertaining not only clicks on websites (big data type sources), but also embodied data related to sound, sight, gestures (e.g. digitizing musical performance gestures), positions, etc. 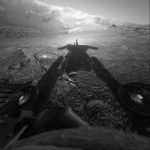 So I invite other ethnographically minded colleagues to innovate together the use of emerging computational means to extend our immersive ethnographic practices. I’m a proponent of playing with and repurposing technologies out-of-the-box and beyond, to deepen our data exploration and engagement. The reason I emphasize “playing” is because it often leads to discoveries outside of the mode and scale of conventional data process. And I find these surprises most fruitful in generating further inquiries and speculations. So far in this series, I have discussed the role of emerging technology in facilitating field data acquisition and processing. In my final post, I will talk about how we can think outside of the monograph as a medium while harnessing the powers of digital platforms to present ethnographic narrative and argumentation. I can’t wait to introduce some creative multimodal ethnographies! 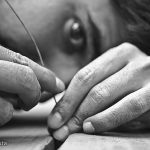 Part 1 On Digital Ethnography, What do computers have to do with ethnography? This is great! Thanks for writing it. As I was reading I remembered that if sound is going to become more common in ethnography then print journals are going to have to figure out how to accommodate sound recordings and more peer reviewed online journals like This space and Sensate will need to go live. I have a feeling you will probably discuss this in your next post. One of my favorite bits of sonic ethnography is Colin Turnbull’s “In the rainforest approaching a forest camp” [http://www.folkways.si.edu/mbuti-pygmies-of-the-ituri-rainforest/world/music/album/smithsonian] recorded in the 50’s. In this short recording contains so much meaning and it’s beautiful. Thanks for your comment, Erik! Yea, I hear you. In my next post, I hope to introduce not only a series of exemplary multimodal ethnographic works, but also suggest publishing platforms that accommodate materials in the sonic and visual register. Sensate, Vectors, and Kairos are great multimodal/media platforms that have started to accumululate legitimacy within the system of academic credentialing. It would be interesting to talk about multimodal ethnographies in light of politics and credentialing system in and around academia. I’m also equally excited to introduce Mukurtu, an open-source multimedia web publish platform for indigenous groups to organize and represent their own cultural materials. I also plan to branch outside the academy to talk about interesting projects (like David Liangs’ Afterquake project) that are inflected by ethnographic thinking. But you’re totally right, there is already a tradition of mediated and non-textual ethnography in anthropology. The works of Colin Turnbull and Steven Feld would definitely fall into that category. I probably won’t be able do an extensive overview of this line of works, but I do think it’s important to figure out how the new multimedia/multimodal ethnography is inflected by the more disciplinarily rooted practice of ethnographic films and field recordings. I’m hoping to sort this out before I write the next post. Do you have any thoughts or insights on that, Erik? Wendy, your posts are always inspiring to read. Thank you for taking the time to share your work. I can’t tell you how much I appreciate it. Your projects all sound incredibly interesting, and the techniques you use are very thought-provoking. Where did you get the idea to zoom in on the album art? Random concept or deliberate approach? I look forward to applying this style of ‘deepened engagement with content’ on some of my commercial projects in the future. Thanks so much, David! I’ve really enjoyed the exchanges that we’ve had either on Twitter, or in this comment section. I love sharing my thoughts. It allows me to take them out of the experimental realm into a more communal and applied context. To answer your question, the idea of zooming in on album art just came to me as I was scanning the image. But the topic of materiality in the digital context fits into some of the broader discussions in the digital humanities community. For instance, Jentery Sayers has written the difficulties of dealing with the materiality of sound in authoring in a digital environment. In a slightly different context, Jentery theorizes an engagement with “layered materiality” in the making of digital projects. I think this relates to the kind of work that I’m doing. As I switch between modes, between the sonic and the visual, ethnic category and geospatial patterns, I’m becoming more aware of the multiple layers of attributes and details that make up what I argue as the meanings of expressive culture. Michael Kramer reflects on the process of inputting musical observations into a spreadsheet. 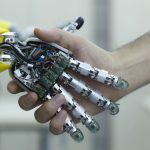 He muses on the question of scalability in his post to say, “The issue is not just to ‘scale’ the humanities, but how we will put the challenge of scaling the humanities on the scales of humanistic inquiry. Michael’s post doesn’t directly deal with sonic materiality via computational methods, but he does bring up the critical issue related to the digital affordance of scalability. Perhaps the most widely read piece in the digital humanities community is my mentor Bethany Nowviskie’s post “Resistance in the Materials” talk that she gave at the MLA Convention. While she spends most of her time using the term material as a metaphor to describe the economic and social materiality of the digital humanities world, in the beginning of her talk, she evokes the tactile feelings of 3D printing to conceptualize the physical-digital continuum in her work: “the fresh, full circuit of humanities computing—that is, the loop from the physical to the digital to the material text and artifact again” I think this is relevant to most of us as we either work on tangible sense-based materials in a digital environment. Ultimately, I think, what that means to be me, is that whatever digital process we engage in does in fact yield a series of material consequences. I imagine that this may resonate with your work, David. And I would love to hear how you would apply this “deepened engagement” tactile in your commercial projects, which, as far as I can tell, leads to material consequences far more immediately than academic works like ours.